Before I start, this may be a bit of a biased review because I’m a Directioner, but I will try and give you reasons as to why you should see it if you’re not one. Unless you have been hibernating for the past three years (like, seriously, where have you been?) you’ve heard of One Direction – the band that lost The X Factor but won the world. The boyband shot to fame during and after their time on The X Factor and their success has been escalating quickly ever since and as a thank you to all their fans they decided to make a behind-the-scenes film, ‘This Is Us‘. Directed by Morgan Spurlock, (Super Size Me) the film gives us an access-all-areas look at the boys’ lives – from backstage to being at home with their families, we get to see it all, including some fantastic footage from their World Arena Tour that’s been taking place all this year. The film is extremely well produced and I cannot put into words as to how well Spurlock did on this film. Even down to the 3D effects, it was nothing like I’ve seen before – and I’ve seen a lot of 3D films. The boys themselves are not shy to the camera, either, especially since their career took off on The X Factor, the biggest TV talent show in the UK. The boys stayed away from any sort of acting and were very open about their lives in front of the lens. Girls who find the boys highly good looking will be in for a treat as there are plenty of shirtless scenes (spoiler alert!) and it’s all in 3D, too. 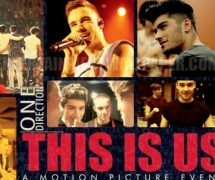 It’s an emotional rollercoaster of a film with scenes making you teary eyed, scenes making you laugh until you’re teary eyed again and it will give you a true insight to who Niall Horan, Louis Tomlinson, Zayn Malik, Liam Payne and Harry Styles really are – just five normal teenagers living an abnormal life. If you’re planning to see this film then I recommend that girls – especially those who get emotional – wear waterproof mascara because it’s very likely you will shed a tear or two. I loved every nano-second of this film and I feel so much closer to my idols. I cannot wait until it’s out on DVD, especially since there’s a 95% chance that there’s going to be even more scenes on the extras section meaning more to look forward to. Out of all the documentary-style films I’ve seen, I personally think this one is the best for more than one reason and I give it a 5/5 star rating. If you’re looking for a reason to be a fan of One Direction then this is it or if you’re being dragged to see it with a friend or partner, I promise you, it will be much different to what you expect. My dad – whose taste in music is very different to mine – loved it despite the fact he thought it would be horrible. 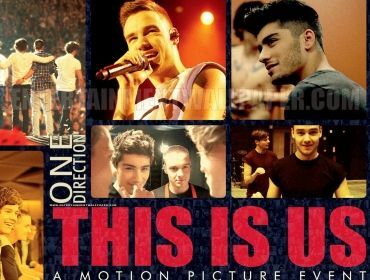 All in all, the film lives up to its name, ‘This is Us’ because it really is them and you can share every moment with the boys.